CAHIRDUGGAN, a parish, in the barony of FERMOY, county of CORK, and province of MUNSTER, 3 miles (S. W.) from Doneraile; containing 1801 inhabitants. This parish is situated on the river Awbeg, by which it is bounded on the north, and on the mail coach road from Mallow to Buttevant and Charleville: it comprises 6148 statute acres, as applotted under the tithe act, and valued at #5216 per annum. The land, in general of excellent quality, is chiefly under tillage, with some good pasture, and the system of agriculture is improving. At Drumcree there is a common of about 262 acres, tithe free, which is used by the inhabitants for grazing cattle. The parish contains abundance of limestone, which is extensively worked for building and for agricultural purposes. Culm has been found in the lands of Baltindaniel, but is not worked at present. There is a patent for holding several fairs, but the only one held is that of Cahirmee, on July 12th, which is one of the largest horse fairs in the South of Ireland. The principal seats are Cloheen, the residence of Lieut.-Col. A. Hill; Hazlewood, of W. Lysaght, Esq. ; Springfort, of J. Foot, Esq. ; Elmvale, of J. Duggan, Esq. ; Danville, of W. Nash, Esq. ; and Monte Video, of H. D. Spratt, Esq. It is a perpetual curacy, in the diocese of Cloyne, and forms part of the union of Buttevant; the rectory is impropriate in C. D. O. Jephson, Esq., and Major Crone. The tithes amount to #340. 11., the whole payable to the impropriators, who allow a stipend for the discharge of the clerical duties: the tithes of five townlands in the eastern part of the parish, comprising 1058 acres, are in dispute between the impropriators, but are at present payable to the lessee of Mr. .Jephson. The church, which is in ruins, was built on its present site in the reign of Charles II. In 1717 the roof was taken off and service discontinued, by order of Bishop Crewe, and the parish was united to Doneraile, from which it was separated in 1758, and continued to be a distinct benefice till 1806, when it was united to Buttevant. 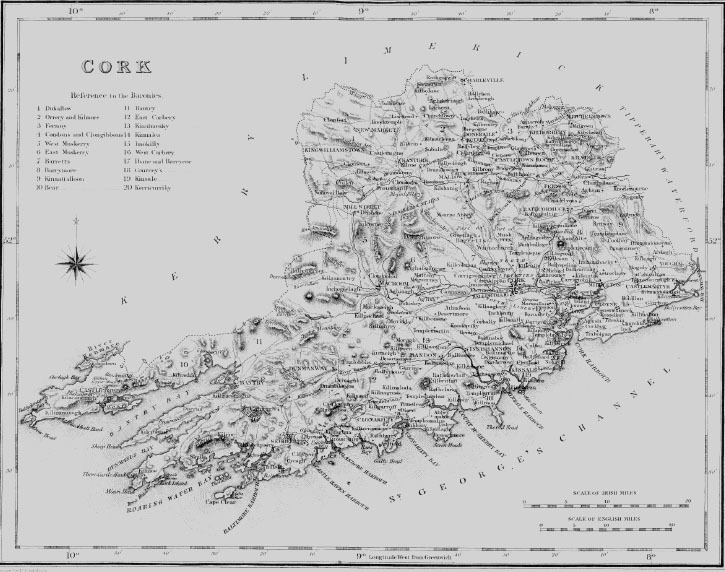 In the R. C. divisions it is one of the three that form the union or district of Doneraile. Several Danish raths are found here iii excellent preservation and generally surrounded by a single rampart and ditch. The site of an ancient castle, formerly belonging to the Roches, is still visible about a mile from Doneraile. Near it stood a considerable village, which tradition says was nearly depopulated by a plague and subsequently deserted.